When we look at music, we know that the style of music can have a great affect on our moods and attitudes. Certain songs raise your energy level, while others can darken your mood. Some can cause you to enter deep into thought, while others can lead you to move about with little thought. It is therefore important to pay attention to the style of the music used in Worship. It is not merely the words, but the ability of the music itself to alter your approach to the words that is important. Traditionally, the Church has treated its hymns in the same way it has treated its theology. One does not simply make up a new hymn just as one does not simply make up a new doctrine – hymns reflect established doctrine and go through a very slow process before they are accepted. Similarly, although people may write new settings for hymns, they follow rules regarding the musical structure and format. One major reason for this is precisely that the stylistic elements of the tune can impact your reaction to the words that are being sung with it. As my chant teacher told us recently, some hymns are available in all 8 modes, so that we me reflect on the words of those hymns in different ways as we experience them through these different melodies. So, although worship is corporate, because we are corporate beings, it is also personal, as it is the means to enter into closer communion with God. From an anecdotal perspective, I must relate my experience of Holy Week this year. We had a monk, Fr. Maximos, visiting with us for the week. Currently a professor at Holy Cross School of Theology, he is also a monk from Simonopetra Monastery on Mt. Athos. You can “meet” him in this 60 Minutes special on Mt. Athos. For that week we had Fr. 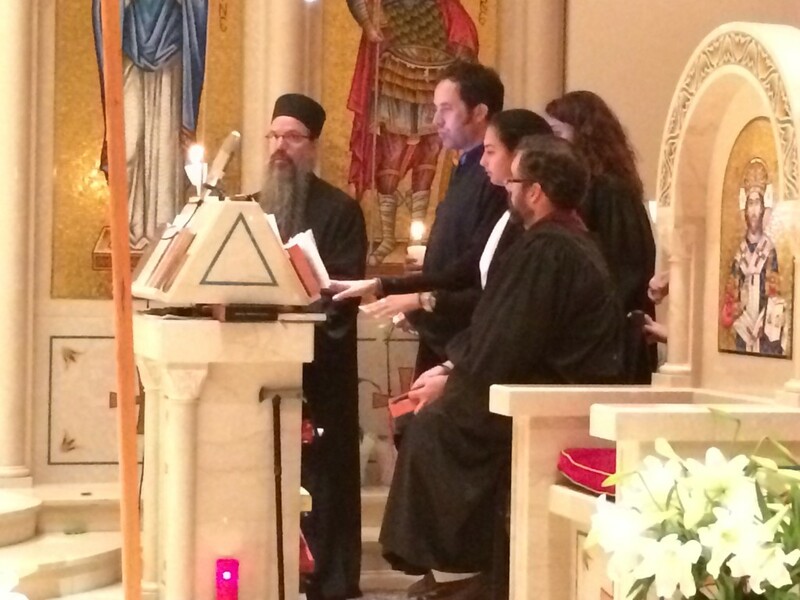 Maximos and our Protopsaltis, Dr. Alexander Khalil leading chanting. The services were longer, in general, than they had been in the past, because we were not doing some of the reduction of the services that had happened in years past. I chanted the entire week through these longer services. Yet, at the end of the week, while physically tired, I was spiritually refreshed in a way that I had never been during our previous Holy Weeks. It was more reminiscent of my sensation after a weekend at one of monasteries. Reflecting back on the week, I think the beauty of the chant, and participating in it, brought me into a much more meditative space. I feel that, at least for brief pieces of time, my mind had moved to at least the edge of the kingdom. I think it was coming just that close to God was so spiritually refreshing. Of course there isn’t just one hymn for Pentecost, but there is one hymn that has come to be known as the Pentecost hymn. In Orthodox hymnody, sometimes there are several hymns addressing the same event from a slightly different angle, with the intent that all of the hymns together will help the listener grow into a deeper, more mystical understanding of the event. One example of this is the Resurrectional Evlogitaria (which we’ll present later), which address the myrrh bearing women’s arrival at the empty tomb. At other times, there is a single hymn that seems packed with a lot of different points, all of which merit some unpacking. The Pentecost hymn is one of those. I’d like to address just a couple of points from the hymn, but there is more there to be meditated upon. Heavenly King, Comforter, the Spirit of Truth, everywhere present and filling all things, the treasure of blessings and giver of life, come and abide in us and cleanse us from all impurity, and save our should, O good one. The first point I’d like to make I didn’t initially intend to address, but a quote from Metropolitan Hierotheos of Nafpaktos landed in my in box, and I thought it worth sharing: “Here one sees the order of the knowledge of God. The heart of man is cleansed by the Holy Spirit, then it knows Christ and then it is brought to the Father.” I won’t spend much time on this, because Metropolitan Hierotheos addresses the topic of of coming to know God at great length in several books, and of course does a much better job than I could. One such book well worth reading is “Orthodox Spirituality”, and another is the “Illness and Cure of the Soul in the Orthodox Tradition”. In these books, as well as others, the Metropolitan addresses the Orthodox understanding of our life in the Church. Our salvation is not a matter of mere rational assent to the proposition that Christ died for our sins, but rather the entering into a life of communion with God. This process may begin with our assent to a set of propositions, but it must necessarily involve an indwelling of the Holy Spirit, which, along with our participation in the ascetic life of the Church, leads us to a place where it grows in its knowledge of Christ, and ultimate of the Father. This knowledge is not a rational knowledge, but rather a mystical knowledge. That is, a knowledge of persons through the direct experience of them. I recommend reading the Metropolitan’s books for a much greater exploration of this topic. The second point is also covered in great depth in a wonderful book that just came out in the last year or so. That is, that quiet little phrase at the beginning of the prayer, “everywhere present.” This is, in fact, the title of the book by Fr. Stephen Freeman. In it, Fr. Freeman explores the Orthodox understanding both of God and the heavenly realm. In the modern West we have adopted a view that God and the angels, etc., live on the second story of our universe. They are up there (or in the case of the demons, down there in the basement), and we are down here. Every once in a while God bangs around upstairs so we can here Him, and once, a long time ago, he sent Jesus down here for a bit. Otherwise, in our day to day lives we live somehow apart from what goes on up there. However, that is not really how things are. Yes, the metaphor of God being “up there” is useful for us, as it helps us think of upward progression. However, the reality is that heavenly realms are all around us. We are just generally too blinded by our passions to be able to see. It is interesting to note that there are numerous stories of both very young children (who have not become sufficiently blinded yet) or very holy individuals (who have managed to progress in their knowledge of God as Metropolitan Hierotheos discusses) who have seen amazing and wonderful things during the Divine Liturgy – angels, God’s light, etc. One priest I know was serving a liturgy and a young child was present with his mother at the liturgy. After the liturgy, the mother told the child that they were going to meet with the priest, and the child responded with, “is that the fire man?” When asked why the child referred to him as the fire man, the explanation was forthcoming that during the consecration of the gifts, the priest was surrounded by fire. Saints have been quoted as describing fire descending onto the altar during the epiclesis, or the calling down of the Holy Spirit. Others have reported angels and saints being present in the altar during the liturgy. If one thinks a bit further about God being everywhere present, then the question arises about where exactly, then, is God not present? If He is everywhere, what does that mean for people’s plans to “go” to heaven? What is heaven and hell, if God is everywhere? For a good exploration of this, I would recommend both Fr. Stephen’s book, as well as this piece. In addition, this talk, given to a youth group many years ago, is worth a read.